This postcard image doesn't do much to convey the beauty of the Commonwealth of Puerto Rico — it could almost be any spot in the United States where roads and automobiles eclipse human-scale neighborhoods and common sense — but I thought it would be timely to share this in light of the devastation and ongoing (and it will be ongoing for years) humanitarian crisis on that island, caused by Hurricane Maria last month (see The New York Times and The Atlantic for the latest). Tourism is incredibly important for Puerto Rico's economy, and it will be important moving forward as the island struggles to get back on its feet and support its residents. This postcard was mailed in May 1968, and it was from my 73-year-old great-grandmother Greta to my 20-year-old mom, around the time Mom was a student at Lycoming College. (The postcard, though, was mailed to a PO Box in Moylan). Like it here, hot & rainned [sic], thunder & lightening [sic], so couldn't get out to see inside Fort or where Ponce de Leon is buried in the Cathedral.1 Sorry! Came back from tour for lunch on ship & then went shopping in afternoon. 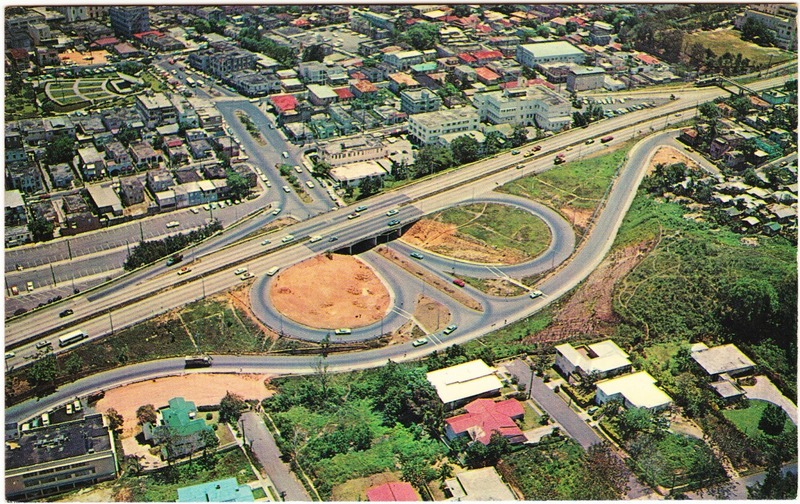 Cloverleaf entrance to Rio Piedras. 1. Said cathedral would be Catedral Metropolitana Basílica de San Juan Bautista. Juan Ponce de León, who died in 1521, is entombed there.